“My daughter is 12 months old and I’m trying to teach her how to fall asleep and stay asleep on her own. She does pretty well at night. She goes to sleep easily and can sleep through the night for 11-1/2 hours.” Wow! Good job Jenny and daughter! Jenny, nap coaching is definitely the hardest part of sleep coaching. And you and your daughter have done a great job! Look at how much she has learned in just nine days. She is sleeping through the night! And just so you know, naps take on average two to three weeks to fall in to place. Usually, the first nap is the easiest and the second nap is the hardest. So, you are right where I would think you would be at this stage. You’ve gotten her sleeping through the night and you’re struggling with naps. And catnapping is tough, especially if she has been catnapping for a year! How Do I Avoid Disaster Naps? Remember my rules about catnapping that are outlined in detail in my book “Good Night, Sleep Tight”. You put her in awake for her nap. And when she wakes up under 45 minutes, you’re absolutely right, that isn’t a complete nap. I would go in, reassure her, “it’s okay, sweetie,” give her a little pat, a little reassurance and then depending on whether you’re staying in the room or leaving and doing checks, I would do that. I would really try for an hour if you can. If not, try at least a half an hour to see if you can get her back to sleep. If she doesn’t go back to sleep, you do dramatic wake up, get her out and then you’re going to have to try for the next nap again. That could be 45 minutes later because she hasn’t had a really good nap. It is true that while you’re nap coaching, you’re kind of tied to the house! Don’t lose hope. Know that this is the hardest time and you have to keep going. It does get better. The morning naps are going to fall into place first and then that little stubborn afternoon nap will fall into place, especially if you’re consistent. Okay. I hope that helps, Jenny. For more details on nap coaching, see my book “Good Night, Sleep Tight”. I would love some help. I have a bright, alert and happy 6 months old baby boy whom I have rocked to sleep for every night and nap. I just started your sleep training last night for his bedtime as he started continuously waking up throughout the night and I would have to rock him to sleep or nurse him again. So, I started putting him to sleep by rocking and before he was asleep I put him in the crib, which he promptly “woke” up from and wanted to play. This happened tonight as well. He will want to play with me for like 30 to 45 minutes, or just play in his crib. I kept trying to turn him over as he sleeps on his tummy, but I fear that made him more mad or more stimulated….He’s just never fallen asleep on his back before. Basically, do I just sit next to his bed while he plays until he just gets so tired that he starts crying and then I can pick him up and put him back down like you suggest? This is what finally got him to settle and sleep but I fear it’s b/c I was holding him (albeit only for a few seconds) and not b/c he just put himself to sleep in the crib. We have a 13 month old who moved to one nap early. She sleeps fairly well at night, 11-12 hours, with fussing here and there, but nothing we need to go and check on (knock on wood). However, we really can’t get more than 45 minutes to an hour out of her for a nap. We have room darkening blinds, white noise to drown out Big Brother and I am consistent with the time I put her down (between 12-1, depending on if she wakes up at 7 or 8; she has lunch beforehand). She wakes up and I do not go in right away, I usually wait 15-20 minutes, but she does not go back to sleep. If I go in, however, it just results in hysterics if I leave. So if I go in, I’m committed to getting her up. Is there anything I can do other than wait longer to see if she goes back to sleep or just gets upset at being by herself for so long? roseyposey That sounds so frustrating!! 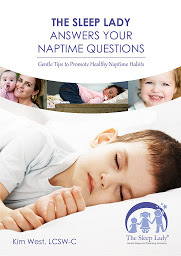 It’s possible that he’s going through thehttp://www.sleeplady.com/baby-sleep-problems/pre-toddler-sleep-regression/…I would recommend that you post your question on http://www.facebook.com/thesleeplady so that the Gentle Sleep Coach can help you. She’s also offering free 15-minute consultations this week, which may help quite a bit!